migrants have generally worse labour market outcomes than the Australian born population. This followed a veritable conga-line of reports of widespread rorting of Australia’s temporary visa system. 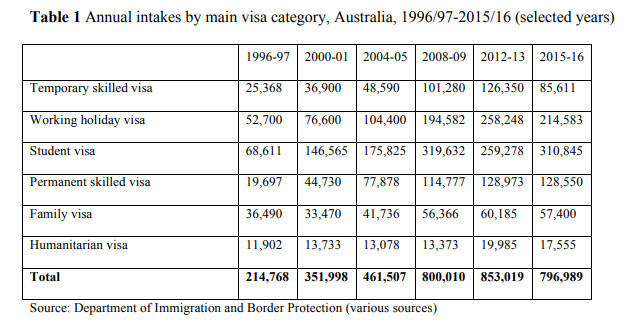 This institutional erosion has left a group of workers already at greater risk of mistreatment less able to assert their rights, thus providing an incentive to unscrupulous employers… If Australian governments are to continue their experiment with temporary visas, a strengthening of immigration and employment institutions is likely to be necessary in order to maintain public confidence in their immigration policies. Here’s yet more evidence that Australia’s so-called skilled migration system is one giant fraud that is failing miserably to meet its original intent, while robbing developing nations of their talent. CPI in detail: Bullhawks crash!